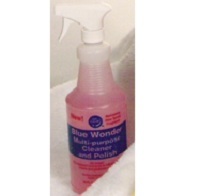 *Cleaner, polisher and air freshener ALL IN ONE! *Eliminates the need for numerous cleaning products *Saves $$ *No offensive chemicals *Makes cleaning effortless *Works well on stainless steel,brass,hard painted surfaces,marble,formica and many other surfaces *Repels dust and grime *Makes future cleaning easier and less frequent *Watch items get brighter with future use **Gallon concentrate in your favorite fragrance or no scent (makes 5+ gallons) *discount available in case lots for quart and gallon sizes *Blue Wonder is used by many Recreation Centers to clean and keep Pads from cracking and to restore luster. Hotels also like using one product.